How cool! I love your Mary Engelbreit or copy of Mary’s art, tea cup!! Love the commentary too. You are SO artistic. I need to be in your life so that some of it would rub off on me. This is a lovely idea. I have just the basket in mind to use. such a wonderful cozy basket! great idea! What a warm and inviting post, Dawn, and an inspiration. While I haven’t made a Basket of Sunshine, I tend to keep a basket here and there with items that “gladden my heart”. 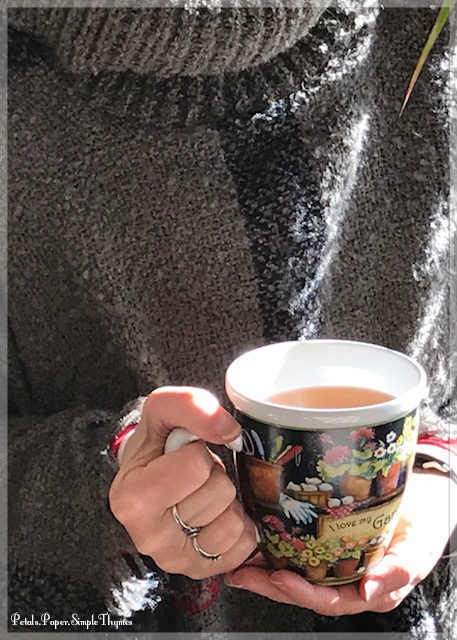 I love teacups with saucers, but, there is one mug one of my daughters gave to me a few years ago that I often sip tea out of as it reminds me to “be still” and so, I do! I have many scarves and wear them all, sometimes using one for a table runner. Now, you’ve given me another idea and that is to nestle one in a basket. Thank you, thank you. Oh, thank you, Penny! It’s so important to be intentional about savoring small moments of joy in each day. So, having a big basket filled with ‘joys’ really struck a chord with me! I love your idea of adding a special mug to my ‘Basket of Sunshine.’ I have noticed you wearing several beautiful scarves, my friend. Lovely scarves are among my favorite treasures, too! Each scarf holds so many memories. 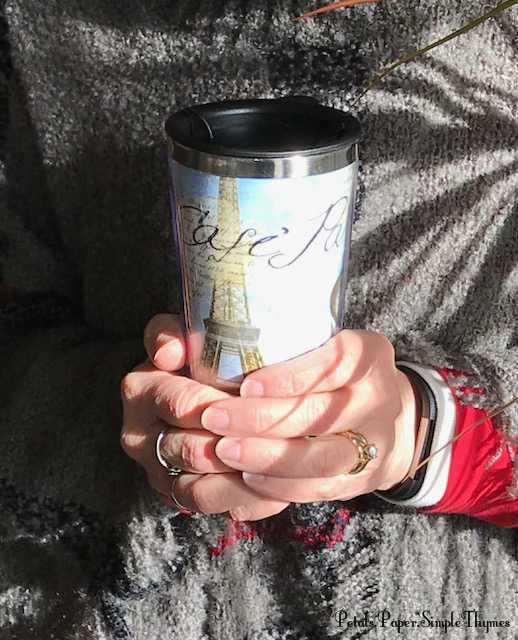 They are my very favorite souvenirs of travels in Europe (wearable art and so easy to pack!). I also cherish a few handmade scarves that were gifts from very talented friends. They always add a special warmth to the body, heart, and soul. I can just picture you nestling a favorite scarf into a basket today. my friend. 🙂 It always tickles my fancy to put things together in new ways! Here’s to scarves and savoring moments, no matter how small – and here’s to finding out who that night visitor was. Dawn, this is such a nice idea. I smiled to myself several times, as you so often influence my thoughts. I love the Lang calendars. Are you surprised? 😉 I also have a basket similar to yours, but I’ve gathered all true emergency supplies there after last year’s crazy rain and floods (and of course fires). I’ll have to pull out another one so I can embrace the idea of a basket of sunshine for my hygge emergencies. I’m just finishing a book called “My Year of Living Danishly.” Have you read it? The author is British, but moves to Denmark with her husband for a year when he lands a job working for LEGO. I fell in love with the culture and the people. I wish we could adopt more of their way of living. She talks about hygge as well. I can mail you my copy if you’re interested. Please just say the word. And finally, I just read the bio of artist Rae Dunn who embraces the concept of wabi-sabi in her work. Sending you a big, virtual hug. Thank you so much for telling me about The Year of Living Danishly! Our library doesn’t have a copy, but I just put a hold on the eBook. I’ve already been enjoying the introduction… and it has captivated me! We have also dreamed about living abroad from time to time. Could you share the title of Rae Dunn’s biography? I keep seeing pictures of her mugs on decorating blogs. I’m completely smitten with the clean, simple look! We are kindreds in so many ways, Alys! Lang calendars are a real tradition in our home. I have been hanging the ‘Heart and Home’ calendar, by Susan Winget, in our pantry each year for 30 years! (It’s so funny that I had to teach my husband not to scratch trivial things (like dental appointments) on that beautiful calendar. “It’s only for birthdays,” I would explain! :)) I adore the beautiful artwork on Lang cards, stationery, stacking boxes, mugs,… everything! :) Until recently, the Lang products were produced in the charming, little town of Delafield, Wisconsin. So, every Autumn for over twenty years, we would plan a Girlfriends Getaway to visit Delafield. Their charming shop was in converted, old church. Swoon!! We timed our weekend for their annual Factory Sale. Shoppers were invited into the Lang factory (which looked like a castle). It always felt like a happy holiday party, as all of the Lang fans (more Kindreds!) waited in line for hours to shop for special Christmas gifts! Those were the days!! Sadly, a few years ago, the Delafield factory closed and their manufacturing moved to China. Ever since, we have been concerned about what would become of Delafield. Lang was a major employer for the pretty, little town. Rae Dunn has written two books and she also has a blog, though it seems to be photos without text. Oh.my.heart! Thank you for the wonderful links, Alys! I didn’t know anything at all about Rae Dunn, but for the past several months, her beautiful, simple ceramics have caught my eye on many different farmhouse decor blogs and on Instagram. Just this morning, while having tea at a friend’s lovely home, Rae Dunn’s ceramics on the kitchen counter made my heart smile. I just adore these pieces! I learned about Rae Dunn via a friend I’m acquainted with on Facebook. She’s a collector. I met her (Carrie Marie) via a Facebook group for Little Free Library stewards. I crafted a miniature LFL for her a couple of years ago. It’s all serendipity as far as I’m concerned the way we find each other and connect and share and relate. It makes me happy. I love the story about the girlfriends weekend to the Lang factory. What a shame that they, like so many others, have moved manufacturing to China. Dawn, have you kept your old calendars? I challenge myself to repurpose my wall calendars each year. I’ve turned the pages into bookmarks, envelopes, and even made a gift card holder once. I’ve also used them to line drawers. They’re far too pretty to simply recycle. I love the “food for thought…zero Smart Points” comment. You’re the best. Alys, I have saved many of my Lang calendars over the years. Right now, the beautiful pages from the Lang ‘Sunflowers’ calendar are repurposed as a colorful banner along one wall in my little Paper Garden studio. Whenever I glance up from my craft table, the bright sunflowers warm my heart! I’m smiling (again). I made a paper banner out of a calendar I received as a gift a few years ago, and hung it in our guest room/my son’s room. (he’s away at college). I found some vintage rayon ribbon at my friend Donna’s booth at Antique Row. It’s the perfect compliment. Off to do my yoga before I head off to work! Kindred spirits, dear Chris! You are so welcome! I think you will love Wabi-Sabi Welcome. Wait until you see the gorgeous photography! One day, I took her book back to the library, just so I could sit and read it by the cozy fireplace there! 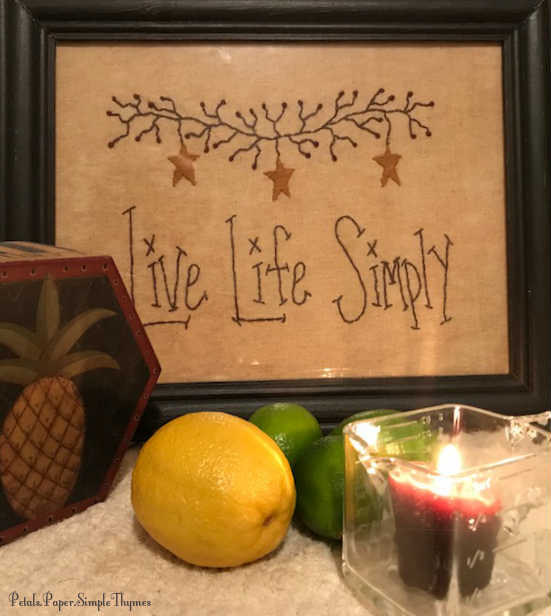 Julie Pointer Adams inspires readers to embrace the imperfect in our homes and to easily and thoughtfully welcome guests. 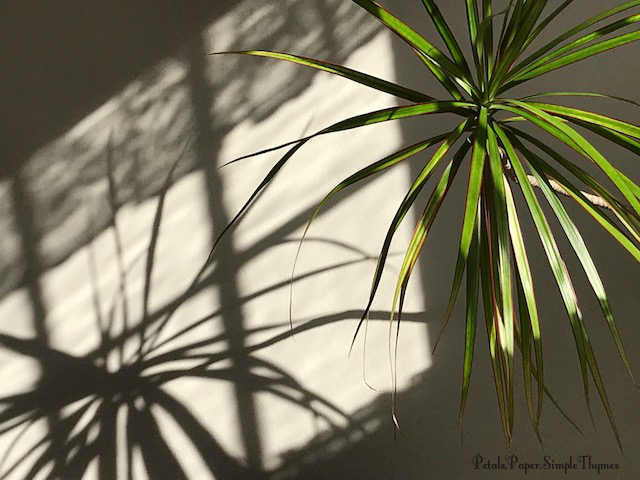 The Japanese philosophy of Wabi-Sabi is so lovely! 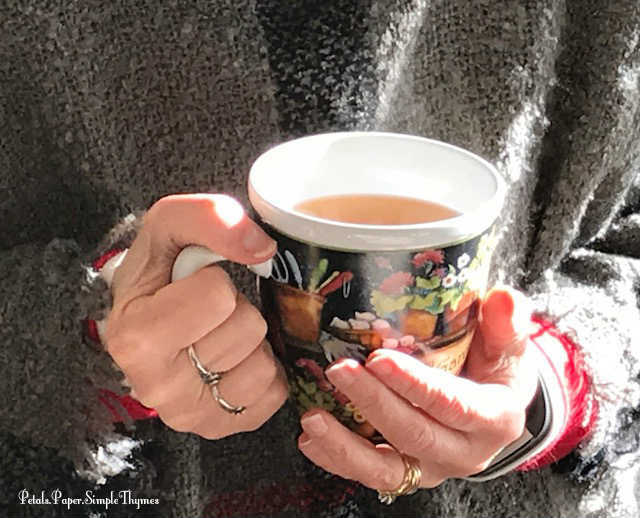 The more I learn about hygge and wabi-sabi, the more I want to learn! Oh, I would love to reach into your ‘Basket of Sunshine,’ too! A grapefruit-scented candle sounds heavenly! Each time I wander through Crate & Barrel (my favorite store), I linger just to smell their grapefruit candles. Thank you for introducing me to Braiding Sweetgrass, Chris! Our library has the audio version or the eBook available. Which do you think I would enjoy more? Yes! Seed catalogs are a definite ‘must’ for a ‘Basket of Sunshine.’ I just added the new catalog from White Flower Farm to my basket. Do you receive their catalogs? If not, you must subscribe. Whenever a catalog from White Flower Farm arrives, it makes this gardener’s heart so happy! Special photographs are the perfect things to keep your a ‘Basket of Sunshine,’ Chris! Each photography holds years of memories while capturing a special moment in time. I just have to share… For my Artist Date last week, I went to a Memory Collage class. It was just amazing to create a special collage of the past decade of my life, using black and white photocopies of special photos (all with torn edges). I titled it “The Fairy Tale Girl.” 🙂 I could have used a larger sheet of watercolor paper to hold my collage, since I have so many passions that I cherish! One day, I will copy more photos for another collage. Perhaps, in time, I can create a collage highlighting each decade of my life, to accompany my Memoir Writing. It was such an amazing Artist Date, Chris, because it truly inspired my creativity in exciting new ways!! Such a fun activity. I will definitely create something like this! Martha Ellen, all of the things in your ‘Basket of Sunshine’ would make me smile, too! It would be such fun to peek into your England journal and your Garden journal (over a cup of tea, of course!). I think I will have to rotate my Susan Branch books into my basket, one-by-one. I just squeezed in her Gratitude book today, along with a pair of cozy, warm socks. I only have one Gladys Taber book, but it definitely belongs in the basket when there is room. Since the ‘Basket of Sunshine’ is still new to us, we can figure out the best ways to make it work. Perhaps after enjoying a special item, we could replace it with another item. 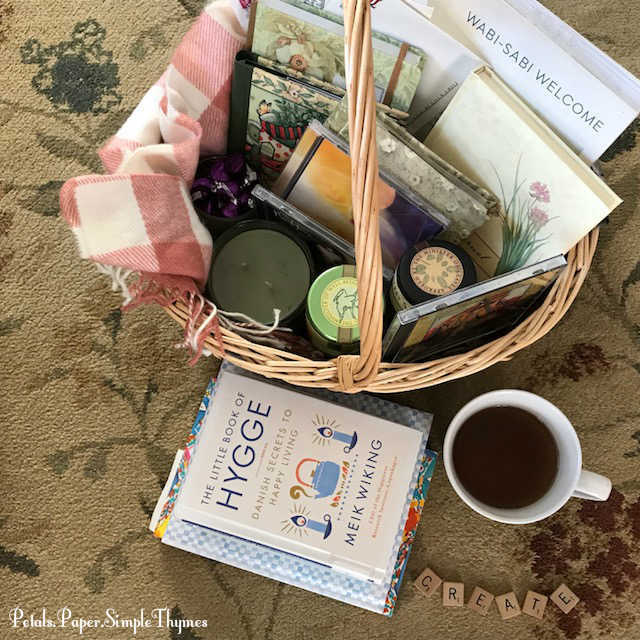 Goodness knows, our homes are filled with hygge and all the things that bring us comfort and cozy feelings! 🙂 It’s nice to highlight them and enjoy them from day to day. Dawn, I would go for the audio version if it were available. I love to listen to audio books on my way to work because it ‘s a 40 minute drive. I learned about this book when Margaret on A Way To Garden interviewed her on Public Radio. http://awaytogarden.com/braiding-sweetgrass-robin-wall-kimmerer/ Hopefully the link will work for you. I just had to have the book after hearing the interview. I have always felt a deep connection to the earth and her book just resonated with me. It sounds like you need to do a post on your collage. How interesting! I would love to see it. Dawn, You made my day coming the other night to Artis to see my presentation!! But you blew me away with your gift of JOY!!! I’m a little under the weather so I’m using your gift right now and it’s soothing my soul as I drink!!! How thoughtful of you to think of me!! What a gift you are and I’m GRATEFUL and JOYFUL!!! Marcia sent me over to find you and I am so glad that she did. I have loved looking at your older posts and look forward to the new ones, as well. I have such limited space in my little trailer but the idea is just lovely. I have shelves in front of my bedroom window that I have pretty things that make me happy. 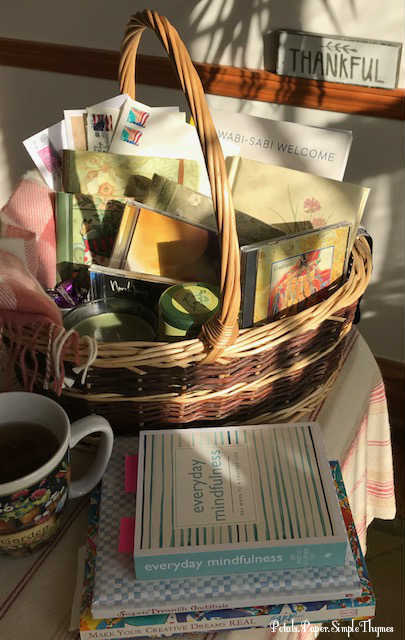 You did trigger a very important thought about making a little welcome basket for a guest coming to stay for a couple of days. Now I need to decide what to put in it. I know I have seen them here or there but something will turn up in research. I have a basket, now for the good stuff. 🙂 You do inspire me.